The SureCall TriFlex Yagi has been discontinued and replaced by the new and improved SureCall Fusion5s Signal Booster Kit. 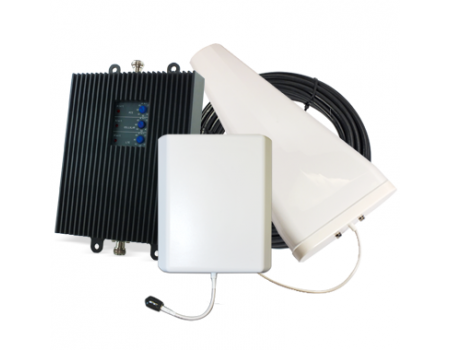 p>The SureCall TriFlex Signal Booster Kit by Cellphone-Mate is a wireless signal booster that can amplify the 2G and 3G networks from most major carriers plus a single 4G LTE frequency. 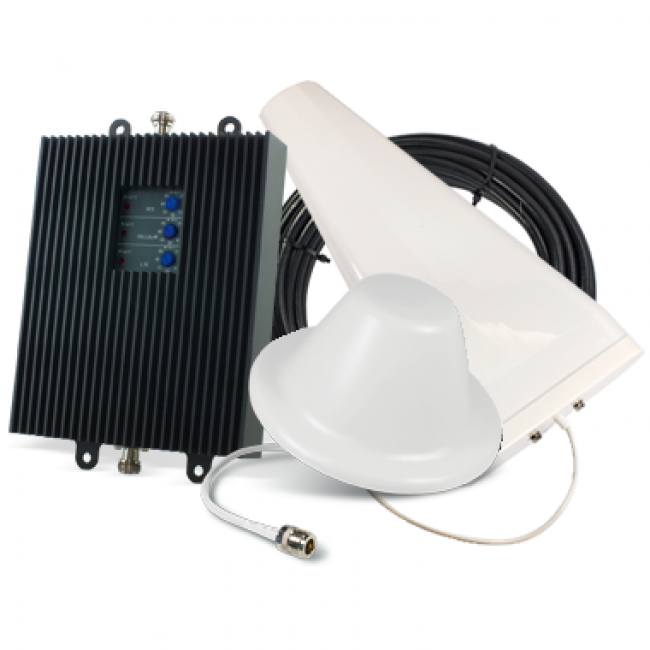 The SureCall TriFlex repeater features a powerful 72 dB gain which gives it a total coverage area of up to 6,000 sq ft (depending on existing outside signal strength) when paired with the included omnidirectional antenna making this the ideal amplifier for large homes and small to medium offices. Because this is a powerful amplifier, you must have a minimum of 20 ft of vertical separation between the inside and outside antennas. Adding up to 75 feet of horizontal separation can help improve the performance of this signal booster by minimizing the potential for oscillation (feedback) between the inside and outside antennas. 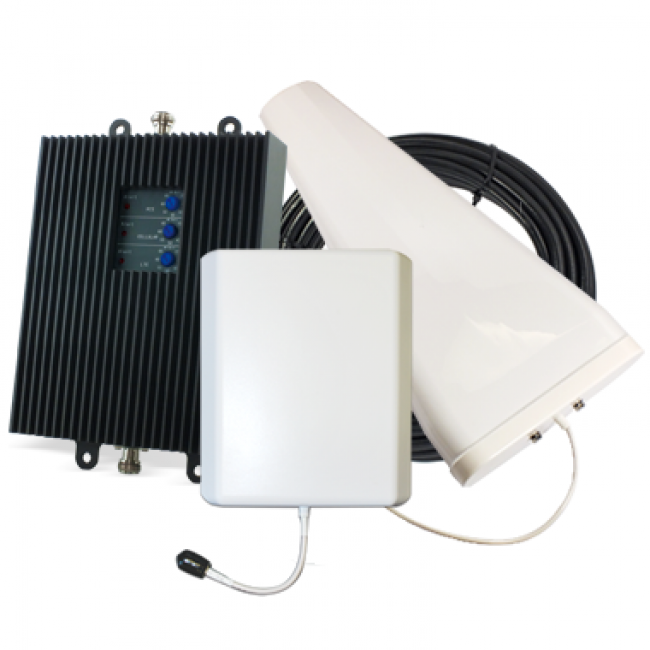 TriFlex for AT&T & US Cellular 4G LTE - The TriFlex-A Amplifier supports most major 2G and 3G carriers plus the AT&T & US Cellular 4G LTE networks. TriFlex for Verizon 4G LTE - The TriFlex-V Amplifier supports most major 2G and 3G carriers plus the Verizon 4G LTE network. TriFlex for T-Mobile, MetroPCS, Cricket, and Canadian Carriers (AWS) - The TriFlex-T Amplifier supports most major 2G and 3G carriers plus T-Mobile's 4G and 4G LTE networks, MetroPCS 3G and 4G, Cricket, and the 4 main Canadian Carrier LTE networks from Bell, MTS, Rogers, and Telus. Dome Antenna - Best for covering a single floor. Mounts on the ceiling in the middle of the space. Panel Antenna - Best for covering multiple floors, or long narrow spaces. Can be mounted on a wall or a ceiling facing down.